Cheers and beers to all the hop heads! For our beer of the week, we're road tripping to northern California for some Happy Hops; an IPA from Russian River Brewing. A hoppy IPA that pays tribute to an old brewery from Santa Rosa. Greg talks about his trip to Paso Robles to do some wedding research and the gross old people making out in the parking lot. Dan reviews a new horror movie for us: Aterrados. Elvia joins the show to break down the new California DUI laws for us, and what it ... Más informaciones means if you get caught drinking and driving in the golden state. 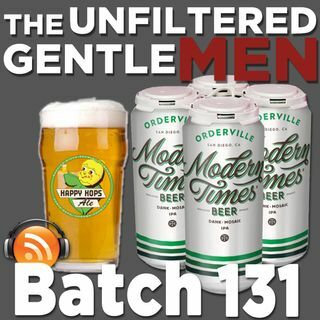 Our Bullpen Beer is Orderville IPA from Modern Times. Scott has a repeat customer in his Tales from Uber. In Booze News: Boston is getting a new booze delivery service, Kirkland has terrible news for crap beer lovers, Taco Bell is partnering with a brewery, MillerCoors is making less beer, the Kentucky Derby doesn't understand craft beer, Pizza Hut delivering beer for the Super Bowl, and what happens when you test nuclear bombs on beer. Our Beer Babe of the Week is Arianne, make sure and follow her on Instagram @pretty_hops! Old Timey Word of the Week: "Fribble.” Use it in a sentence on social medias for a shout out!